This sci-fi manga is about a young girl named Asumi who leaves home to attend the Tokyo Space School to become an astronaut. If you only look at the cover and flip through the first few pages where Asumi interacts with a guy with a lion head, you might think this is some manga that would only interest tween girls and Matthew Brady. (The cutesy-sounding title doesn't help, either.) But it's actually pretty great. Twin Spica also has got some solid heart-wrenching going on: Asumi has a tragic past and has had to deal with a lot even though she is so young. Her new roommates also appear to have some issues, which helps to keep the drama cauldron bubbling. I'm interested to see their relationships develop as they face new tests and hardships. One can only hope that this reaches the same emotional highs that we experienced when Leaf "Joaquin" Phoenix became "friends for-ev-er" with the robot named Jinx. Ah, Space Camp. About the only downside is Yaginuma's odd penchant for occasionally only drawing one eye of a character, even though the character is standing at an angle where you should see both eyes. Instead, Yaginuma leaves a blank spot. I assume it is some kind of manga quirk that I haven't seen before, but it didn't seem to add anything and just distracted me. Other than that, the art is solid and there are some pretty lovely images in there. 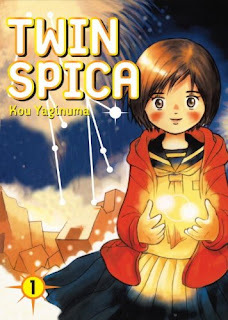 I'm handselling the hell out of Twin Spica! ... The covers make it a bit of a tough sale. :-/ But I persevere. Uh. It's science fiction manga that's good. Like, it's Planetes good. That's really good. I'm with Lydia on this one. Give it a shot. READ MORE: Vertical's website has an excerpt. RELATED: Vertical also publishes Osamu Tezuka's Black Jack, and I reviewed volumes 1 and 2 and volume 3.